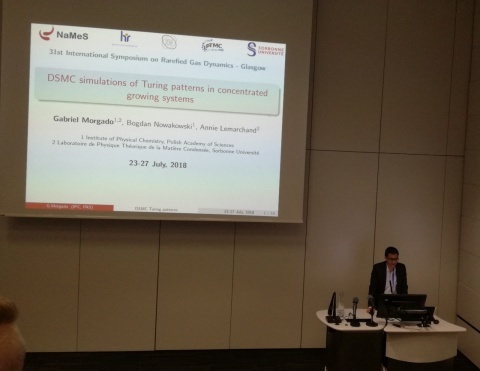 Gabriel Rochinha Morgado, NaMeS PhD student, visited center University of Strathclyde and participated in 31st International Symposium of Rarefied Gas Dynamics, Glasgow, UK. He presented lectures – “DSMC simulations of Turing patterns in concentrated growing systems”. The topics of the conference included, among others, the following issues: Boltzmann and Related Equations , Kinetic and Transport Theory , Numerical Methods for Kinetic Equations or DSMC and Related Simulations.